The attorney general and city of Seattle allege that Purdue Pharma, and other opioid manufacturers, downplayed the risk of addiction. 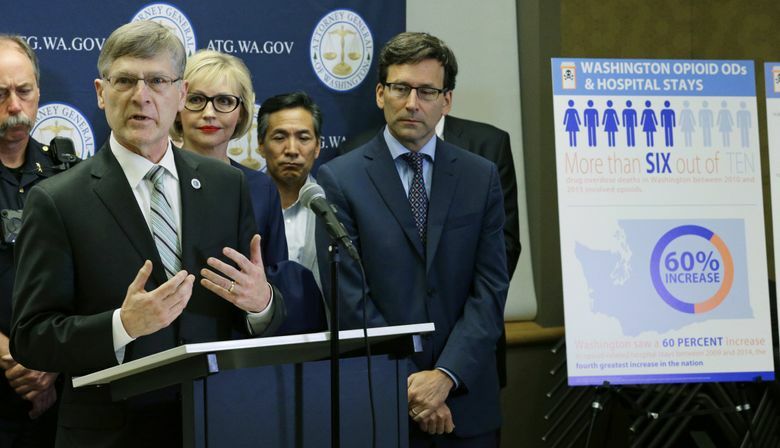 "They ignored what was happening ... for their bottom line," Attorney General Bob Ferguson said, "and that’s not right." 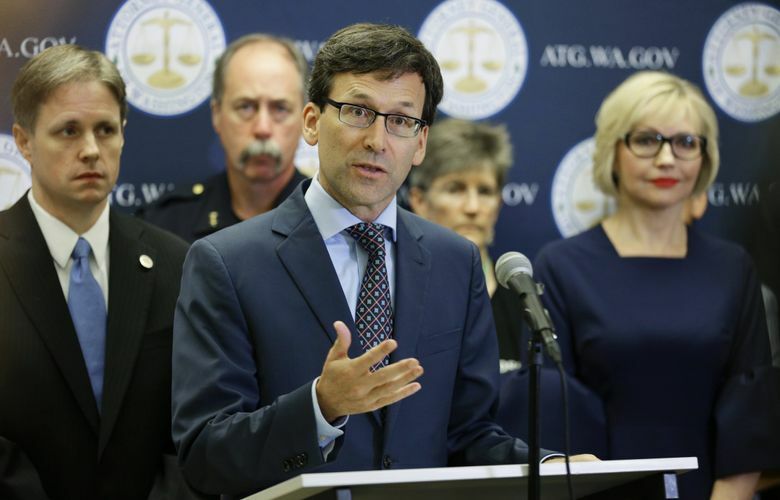 Washington Attorney General Bob Ferguson and Seattle City Attorney Pete Holmes on Thursday filed separate lawsuits against pharmaceutical companies, including OxyContin maker Purdue Pharma, accusing them of fueling the state’s ongoing opioid epidemic. The city of Seattle’s suit includes Purdue, Teva Pharmaceuticals and several other prescription drugmakers. The state’s suit involves only Purdue, accusing the company of using deceptive marketing to convince both patients and doctors that the drug is effective for treating chronic pain and carries low risk of addiction. The company downplayed the risk of taking the drugs, according to the attorney general’s office. Both suits are filed in King County Superior Court, and allege that the pharmaceutical companies contributed to the drugs being over-prescribed by doctors. Ferguson’s lawsuit seeks to force Purdue to forfeit profits made in Washington over the sale of opioids. The lawsuits are the latest in a long string of efforts to curb the opioid epidemic nationwide. In Washington, opioids — prescription drugs and heroin — have caused about 700 deaths a year since 2006. More people died here in 2015 from these drugs than from car accidents or firearms, according to Ferguson’s suit. Yet the nature of the epidemic has changed over time, causing one researcher to predict that the new litigation will have a modest — though important — effect, while a colleague worried that the pendulum against opioids had swung so far that some people who need them for pain might go without. In a news conference Thursday at Harborview Medical Center, Ferguson and Holmes introduced their lawsuits. Ferguson said Purdue had conducted an “uncontrolled experiment” by infusing communities across the nation with misleading marketing about opioids. Such marketing continued, according to his complaint, despite a 2007 court order in a prior lawsuit brought by Washington and 25 other states over the same issue. And yet, Ferugson’s lawsuit claims, Purdue looked the other way when confronted with red flags, including the case of Seattle Pain Centers’ Frank Li. Last year, the state suspended Li’s license, accusing him of failing to properly monitor the use of drugs, possibly contributing to 18 deaths. “Purdue’s sales call notes repeatedly reference how busy Dr. Li and his staff were,” reads Ferugson’s complaint, which also says the company knew about “exceptionally high” opioid prescriptions. Holmes said Seattle’s lawsuit would seek to “recover what’s been lost” because of the opioid epidemic. 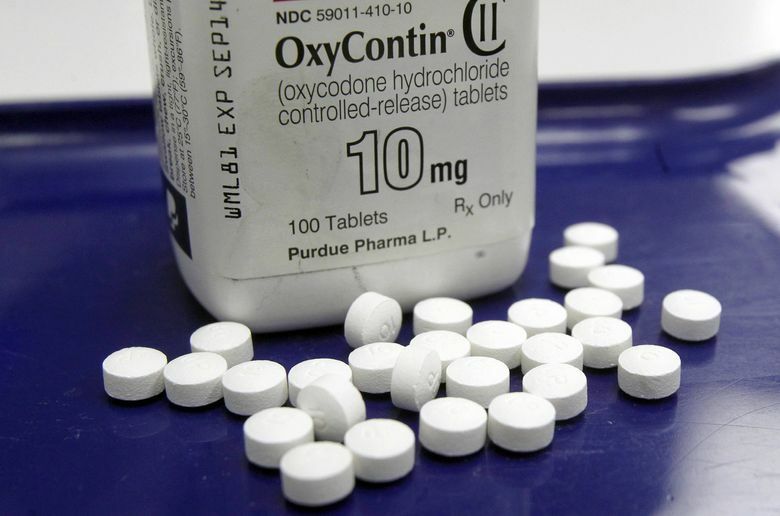 The suit refers to defendants as the makers of brand names like OxyContin and Percocet as well as generics such as oxycodone and hydrocodone. He said the city spends millions each year for first responders who deal with overdoses, social workers who help treat people with addiction, and park employees who pick up needles instead of doing other work. Holmes also linked the epidemic to the city’s homelessness crisis. He referenced a 2016 city assessment that concluded a main cause of someone losing their home, second only to job loss, was drug addiction. “Unlike earthquakes and hurricanes, this disaster is human-made,” Holmes said. Purdue issued a statement Thursday in response to the lawsuits, saying it was seeking motions to dismiss similar suits in other states. They need to present opioids as a last resort, he said, not a first. Yet he expected the suits to make only a small dent in the crisis. The reason, he said, is a big change that already happened years ago after Purdue was charged in criminal court with giving doctors and patients false information about the danger of OxyContin’s abuse. The company reformulated the drug in 2010, making it harder to snort or inject. 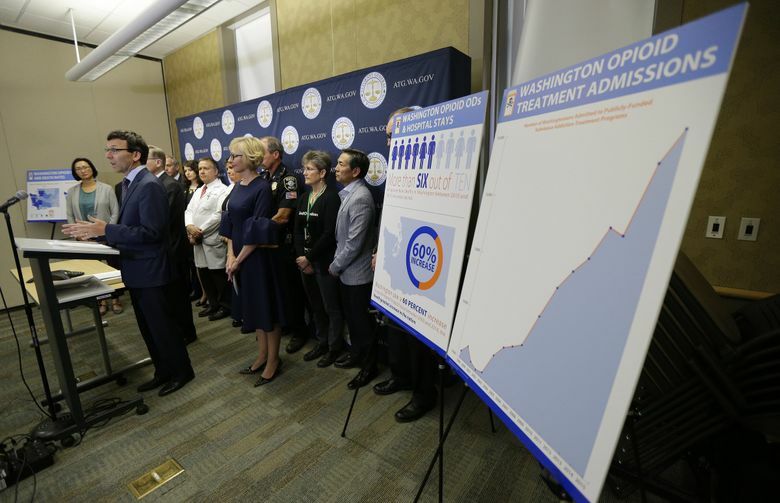 Deaths from prescription opioid use went down — from 532 in 2010 to 435 this year in Washington, according to preliminary state data. “Those people addicted to the drug just switched to heroin,” Banta-Green said. Heroin-related deaths surged during that time period from 67 to 287. Meanwhile, synthetic opioids, like fentanyl, came on the scene. Many turned to heroin and fentanyl after getting addicted to prescription opioids. Still, Gregory Terman, a UW anesthesiologist and past president of the American Pain Society, said he is concerned about all the negative attention to drugs that have a legitimate role in pain management. He looks after patients that have undergone surgery, and some are now telling him they are wary of taking opioids, though dealing with their pain can be difficult without them. While he has spent much of his career studying the risks and side effects of opioids, including breathing problems and nausea, he said he now worries that the risks may be overstated. State and federal authorities are pushing for tighter restrictions on opioid prescriptions and the drug store chain CVS announced last week it would limit such prescriptions to seven days. That’s apart from lawsuits brought by more than two dozen states, cities and counties. Earlier this month, Tacoma sued three opioid makers, and on Tuesday a federal judge ruled that a lawsuit filed by Everett against Purdue could proceed. The governments hope to recoup costs for responding to drug addiction, including money spent on emergencies and social services. The Associated Press contributed to this report. Information from The Seattle Times archives was included in this report.